One of the most powerful features that has been missing from TomorrowsPro is the ability to have your stats your way for reporting, etc. With that being said, filtering is now available on your individual season stats as well as your career stats. These filters can be applied to the stat grid view as well as the graphs. Any filter being applied to the stats grid will also be applied to the graphs and the print views. This allows you to print reports for the last 7 games if you would like. Filters can be saved so you only have to make it once and it will always be there. All of your filters will be available across the site in any place you may see that season (Except for the Teams section for now). 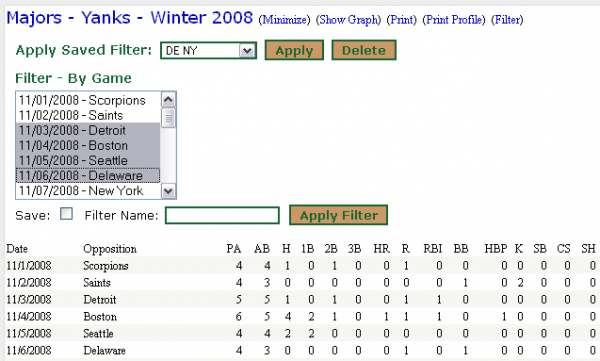 If you have a team season called "Yankees - 2009" and you are viewing one of your teammateâ€™s stats for that season, you can apply any of your saved filters to your teammates shared view of that season. All filters are only accessible by their creator so even though you are applying filters to your teammateâ€™s seasons, they will still see their season the way they always have and they will have no idea you have even created a filter. Also remember that applying any type of filter will hide the rest of your stats temporarily. If you click on the "Remove Filter" link found on any season that is currently being filtered, all of the games will be listed again. In order to start using filters right now go to either your "My Stats" link or get to one of your teammates stats page if they are sharing their stats. You should see a page like the one below. Click on the "Filter" link. After clicking the link a new filtering form should appear like the one below. If you have any saved filters the "Saved Filters" area will appear. You cannot edit filters, so if you make a mistake or want to change the filter, highlight it in the list and click the delete button. You can only save filters when creating them. To do this, highlight all of the games you would like to filter on and check off the "Save" option. Also, don't forget to enter a name for it so you can pick it from your "Saved Filters" list later. Once you apply a filter it will stay there until you remove it. This includes the stat grid and graph views. Whenever there is a filter applied you will know because there will be a link named "Remove Filter". By clicking this link you will automatically remove the filter and all games for that season will be shown again. I hope everyone find great value in this new filtering feature. The most value may be derived from filtering on "Career Stats". In the past, there were never any options to leave out any seasons you had in your stats profile. Now that you have filtering, you can save filters that mean something to you. Maybe you have two out of 5 seasons where you played with a wood bat and you want to know what you batting average was for those two seasons combined. Now you have the ability to see interesting stats like this. Filtering is going to be available only in the Individual Stats sections of the site while the Team Filtering feature is further developed and tested. It shouldn't be that far behind. As always, please report any issues to support@tomorrowspro.com or just drop an e-mail to tell us your thoughts and comments on what you think, how you filter, etc.